God in human flesh is how John 1:14 describes Jesus, God's ultimate message (cf. Heb. 1:1-3). Of course this is a mystery that we cannot fully fathom. It is beyond our human experience and limited reality. Jesus' critics want to easily characterize him as someone who cannot be Messiah because they think they know where he is from. They are wrong. They think he is from Nazareth and not Bethlehem. We know better. 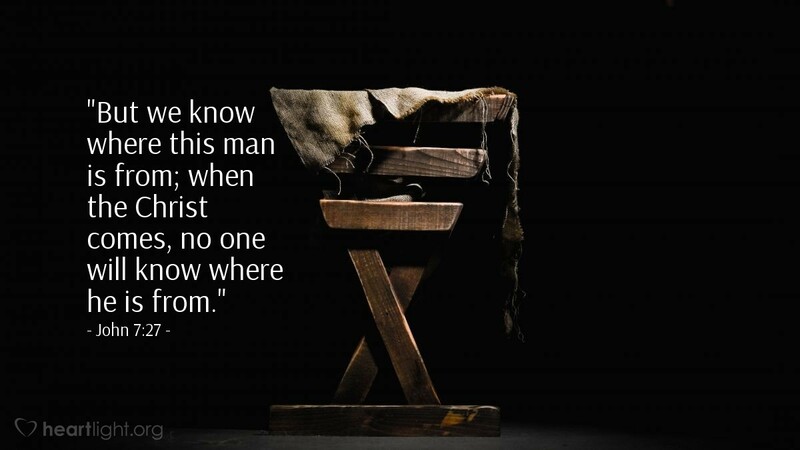 They are even more wrong, because Jesus isn't ultimately from Bethlehem; he is "from above." Jesus exhausts our imagination and overflows our cup of wonder as we seek to understand all that he is as our Savior, Christ the Lord. O Lord, forgive me for my limited vision of Jesus' glory. Enable my heart's ability to find wonder, joy, grace, exhilaration, glory, and awe in his power, his grace, his sacrifice, his victory, and his love. To you, Father, and to the Christ, be all the glory and honor that my heart can muster and my voice can proclaim. In Jesus' name I offer you my praise! Amen.